The bull market is now more than 2,000 days old, meaning it's been going longer than SnapChat and Tinder -- combined. To put another it way, a baby born at the start of the bull market would be entering kindergarten now. Even though many Americans haven't felt the surge in stock prices, the positive run on Wall Street is already the fourth-longest since 1928, according to Bespoke Investment Group. "We've had both a recovery in confidence and a recovery in earnings. It's not a fluke because it's really based on fundamentals," said Anastasia Amoroso, a global market strategist who helps oversee about $500 billion at JPMorgan (JPM) Funds. A bull market is defined as a rally of at least 20% following a drop of at least 20%. In other words, a really big jump in stock prices following a scary tumble. From 666 to 2,000: The market plunge sparked by the Great Recession caused the S&P 500 to plummet nearly 60% as investors began to fear an economic depression. But ever since March 9, 2009, U.S. stocks have soared 200% as a complete collapse of the financial system was averted and economic growth returned. 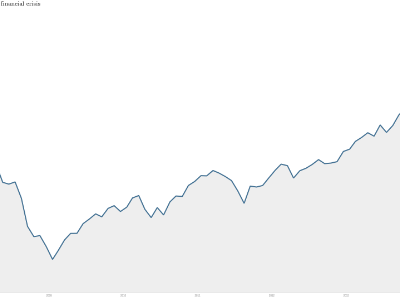 The S&P 500 has skyrocketed from a low of 666 in 2009 to as high as 2,011 earlier last week. 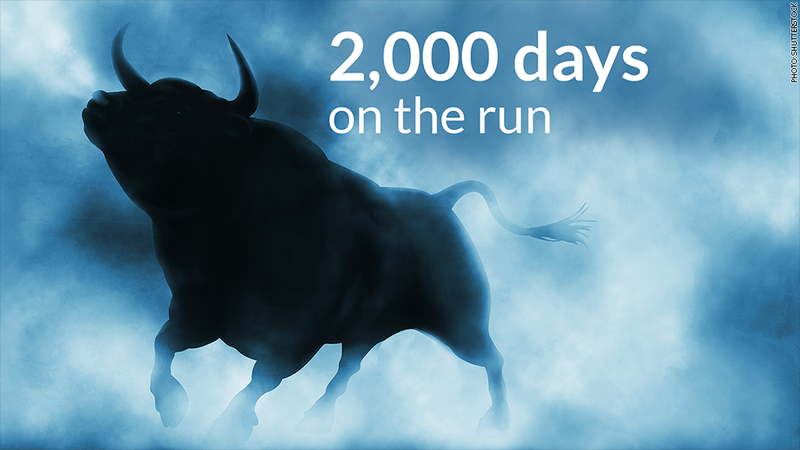 The bull market officially hit the 2,000 calendar day mark on August 30. To put this into context, the average bull market for the S&P 500 lasts just 933 days, Bespoke said. That means the current run is already twice as long as the typical one. Too late to jump in? All of this has led some on Wall Street to fear the string of good luck could be nearing an end. Some even believe stocks are in the midst of a bubble that could pop in an ugly way soon. But optimism is still the driving force in investment circles. More optimistic forecasters say it's not too late to jump into the market, even if you've missed the gigantic rally over the past five years. "We don't see any prospect of a recession any time soon," said Bruce McCain, who helps oversee more than $20 billion as chief investment strategist at Key Private Bank. While the size of the upcoming gains might be more muted, McCain said "you should be able to capitalize on overall earnings growth." Amoroso echoed that sentiment, saying: "It's not too late but investors do need to realize that expectations of future returns have come down." A few market watchers remain very bullish on stocks. Last week Morgan Stanley (MS) predicted the S&P 500 could surge to 3,000 by 2020 because the lackluster economic recovery doesn't appear nearing its end. Longest bull run lasted 12 years: It's worth noting that the bull market isn't even close to as old as the longest two run-ups ever. Stocks would have to rally for almost another two years to match the second-longest ever run ever. That record belongs to the 1949-56 bull market that lasted 2,607 days and drove the S&P 500 267% higher, Bespoke said. The odds are stacked against the current bull market dethroning the all-time record of 4,494 days, or just over 12 years. That remarkable run occurred between December 1987 and March 2000, impressively spanning parts of five presidential terms. The S&P 500 skyrocketed from just 234 to 1,527, or roughly 582%, during that incredible market run. If the current bounce in stocks were to achieve that record, it wouldn't die until 2021. That's when the next U.S. president is hoping he or she will be embarking on their second term.